Today at mile 93 of our Club’s 3rd long run I drowned in a dark, lactic ocean. The winter is upon us and the road to full fitness will be long and lonely. As I have said in previous posts, the Winter is not the end of cycling. The cycling continues but these cold, wet months are about training to maintain fitness, to rest a little and to prepare for next year. Also they are about weight. You might put on a few pounds or take the opportunity to lose a kilo or two. 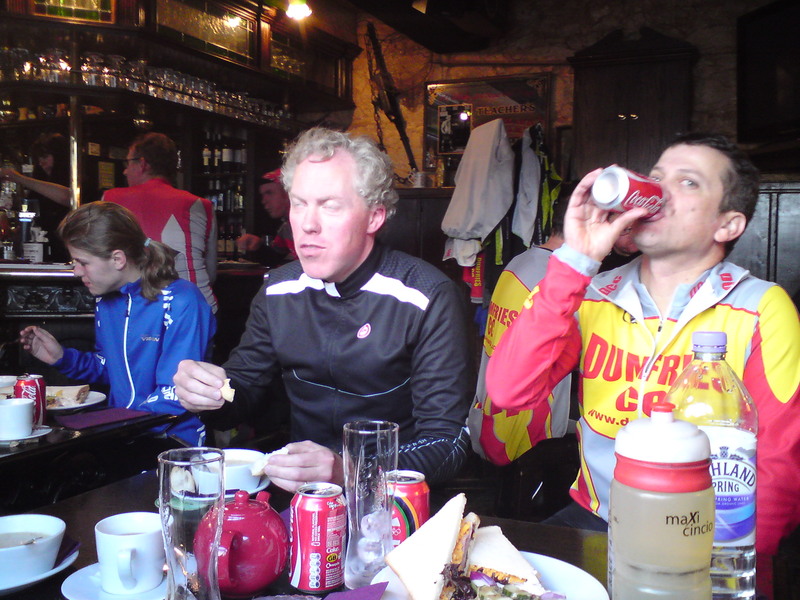 Non cyclists are usually surprised when you say that the winter is a good time to lose weight. Hunger but in a good way…and of course the caffeine! The common view is that weight can be lost in the summer when you’re more actively outdoors. 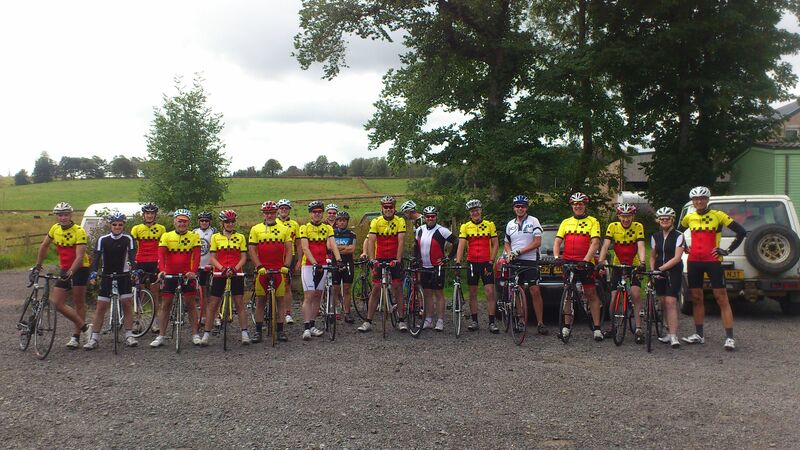 But if you’re a cyclist trying to lose weight in the summer, you’re probably behind the rest of the riders in the club. The winter gives you control and a plan and a regime as does early spring. The summer is too busy a time for that kind of focus. However the focus comes at a price since even with the social side of long club runs, your winter regime is essentially a lonely pursuit. The challenges are only for you and are only set by you. You can’t lie to yourself. Everything must be true and accurate. 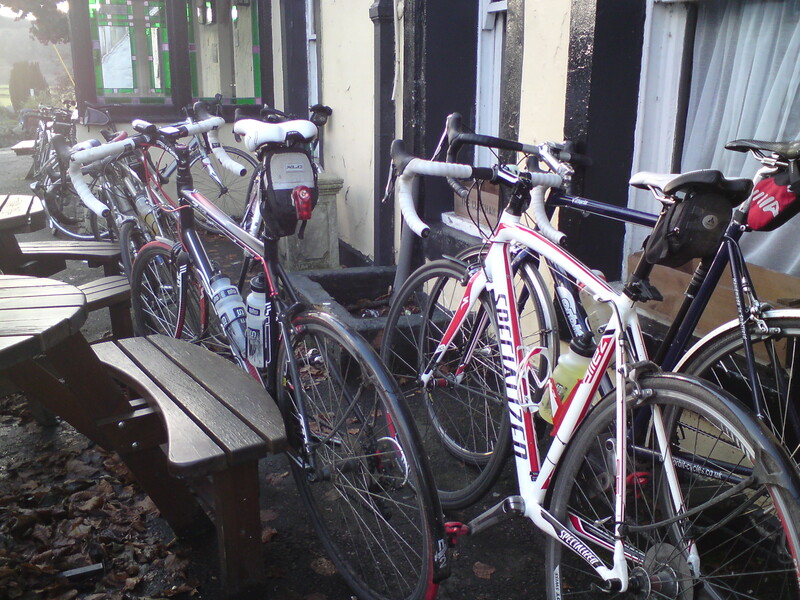 our winter bikes – a means to an end…but what end? On today’s long run which took us along the Solway coast, followed by the spectacular Loch Ken then over to St John’s of Dalry, I spoke to a few guys about their winter. Everyone does it differently but whatever they’re doing, they’re doing it solo. My personal preference is to cross train. This means running, turbo, club run and core. Like all my club mates I have a plan for the winter. I don’t share my targets with them. Why would I? Why would they? But isn’t it amazing how we pursue those targets religiously? There isn’t a cyclist who lies about their winter regime. Well…why lie to yourself? Ian always impressed on me the positive aspects of turboing which has meant I still enjoy it. Lots of guys don’t (yet they still do as much as me). When you’re on your turbo it’s sad but true, even though it is a chariot of pain, it is without doubt, the bike of truth. Those intervals are measured to the exact second as are the pyramids. Cutting corners or poor efforts on the turbo do you no good. 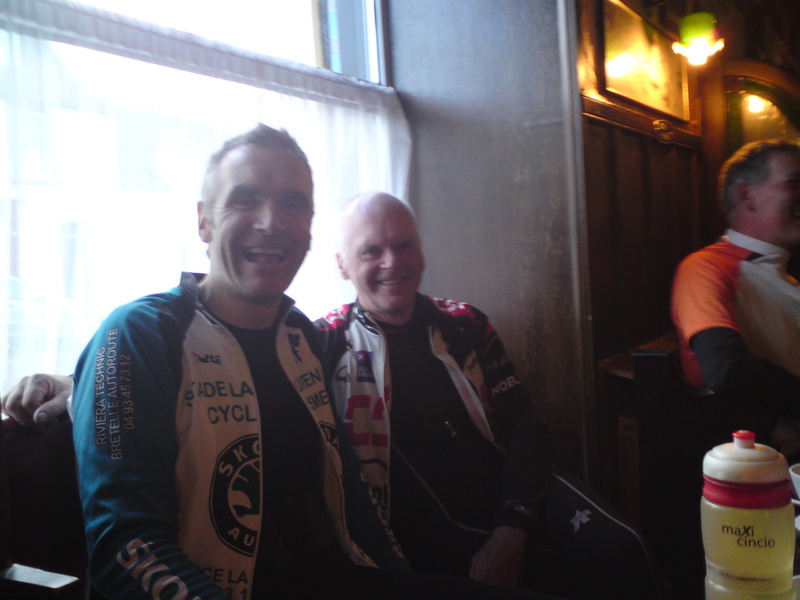 sharing a joke with my cycling buddy Ian Harkness, the man who introduced me to the systematic torture of the body a.k.a the turbo! Yet the turbo also means loneliness. Perhaps this is why a lot of guys buy themselves ipods or imagic turbos; there’s some company in music or a little animated cyclist smashing you on a simulation of the Galibier! I stopped using my ipod recently. My only company is the whirr of the back wheel and the digital clock crushing me relentlessly. The garage is a lonely place, killing yourself between the lawnmower and some old tiles. But it is also a place of self-determination and ambitions. As I said at the top of this post, lactic got me today but as the boys pulled away, something made me keep on turning those pedals even though getting back on the group was futile. I’m not sure what it was: trying to reach towards something or was it keeping something at bay, the body’s pain? Irrespective of what it was, there’s no crisis, no plan changing. The lonely crossing of the winter will continue and who knows, next time I may well pull clear of the lactic kill zone! I had concentrated so fully on physical recovery that when a final hurdle loomed up it caught me completely unawares. Everything normal was new to me when I got out of hospital; eating at a table, sleeping in a proper bed, sitting in the April sun. I made plans to get back to work. Some of the pupils had said I was airlifted from Park Farm. Now that would be a waste of a helicopter trip! I still had loads of visitors. In the midst their good wishes there was always the question of – the bike! Visitors divided roughly into two groups.1. I take it you’ll not be cycling again? versus 2. When are you getting back on the bike? No guesses on which side the Dumfries CC stood. In my mind there was never a doubt I would cycle again? But when? What kind of cycling? According to the Hospital consultant, I was not allowed to cycle till Christmas 2011. However after several x-rays and scans they revised this. 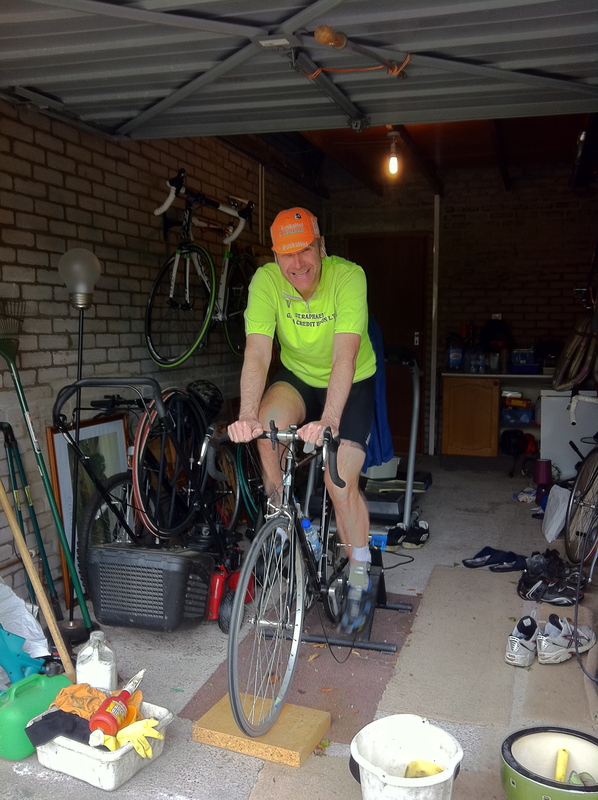 It was July and the consultant said – ‘you’re healed up so you can start to train a little if you want.’ I was glad my wife was there to hear that or else she would’ve said I’d made it up. Lots of guys clamber reluctantly onto their turbos with the first cold blast of November weather. To me it was tremendous. I sat on mine for 30 minutes without tension, in an easy gear. What a feeling of joy it gave me. After the turbo the next stage was to ride my bike on the road again. 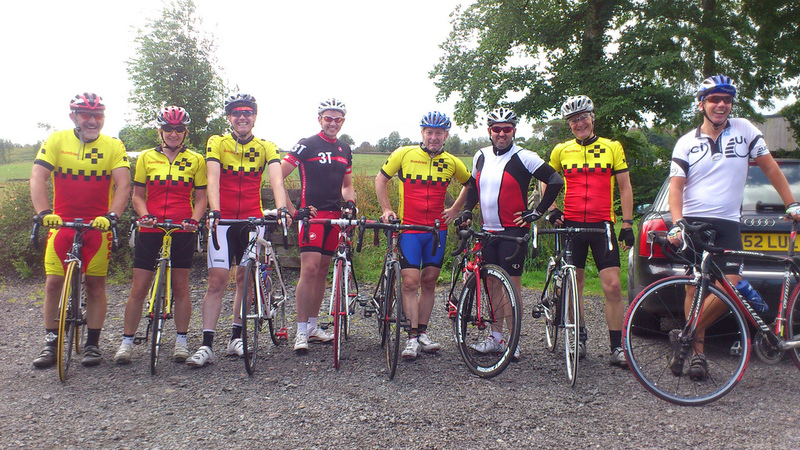 I chose a really warm day at the end of July to spin round Caerlaverock. 18 miles of quiet country road and a feeling of elation. So far so good. 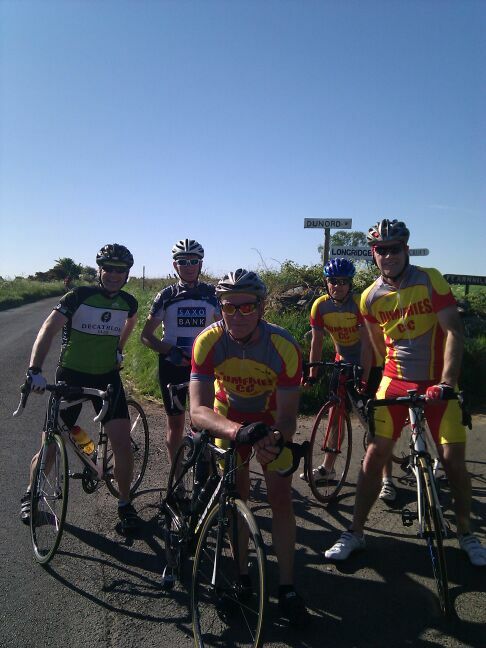 I cycled a little with the early boys trying to feel my way back into riding with a group. 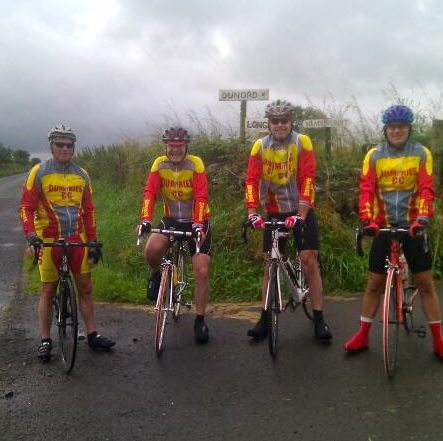 I cycled some evenings with the guys in late August. When the speed picked up they would shout out their postion to me – ‘Inside/Outside’. 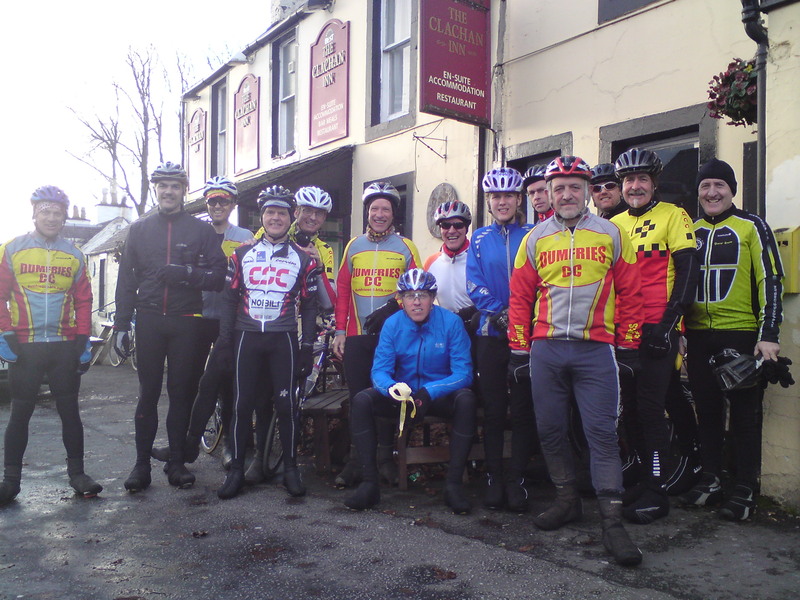 I restarted organising club runs and doing a little filming and website maintenance. I even managed to put on the TLI Daystager race. Everything was getting back to normal. I italicised that word for a good reason. What did it mean – ‘normal?’ As the Autumn arrived I didn’t feel normal even though physically my improvements were speeding up. If anything I felt the opposite of normal. I felt lonely, different, resentful, guilty, angry and most of all, empty. What was worse and really puzzling was that these feelings only emerged when I was cycling. Off the bike I was happy and fulfilled in my home and work life. 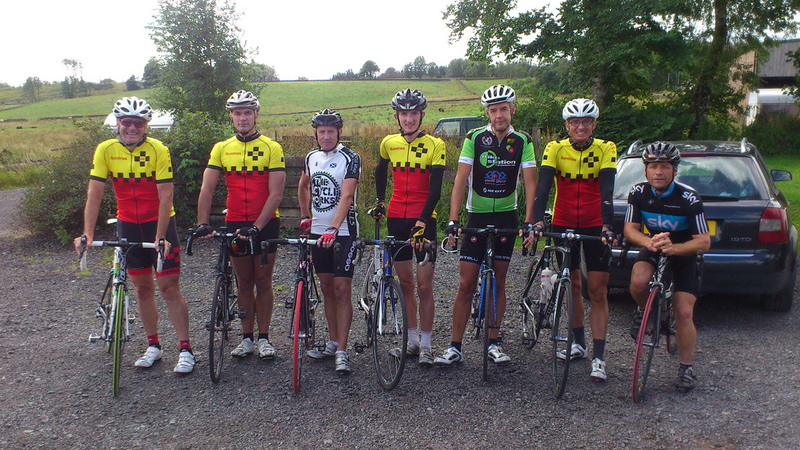 The club runs that I on went at this time were the lowest moments of my recovery and all of my cycling for that matter. I rode, shut off from everyone. What was happening? These feelings had swept over me like a tsunami. If I could’ve stopped them I would have. But somehow i was powerless in the face of it all. Then by chance one day on a long winter run over to Loch Ken, I took a chance and mentioned my feelings to John Andrew. It was the best thing I could’ve done. I said out loud to him…’I’ve been depressed.’ And in saying those words and in talking it through I saw immediately why I was depressed. It was a delayed reaction to my accident. It was as if my mind was saying ‘Well now that your body is on the mend you better start dealing mentally with what happened that day.’ Up until that point I had thought that the air ambulance had pulled me clear of the irrigation ditch but really, part of me was still lying there. Why was I striving to be normal? To be normal again was to pretend that nothing had happened, like gluing together a broken vase. Why was I trying to reach back across my crash and search for a life which had changed? I had to acknowledge the crash and that my life was different now. I started almost immediately to feel better about being on a bike. I was at last fully recovering. 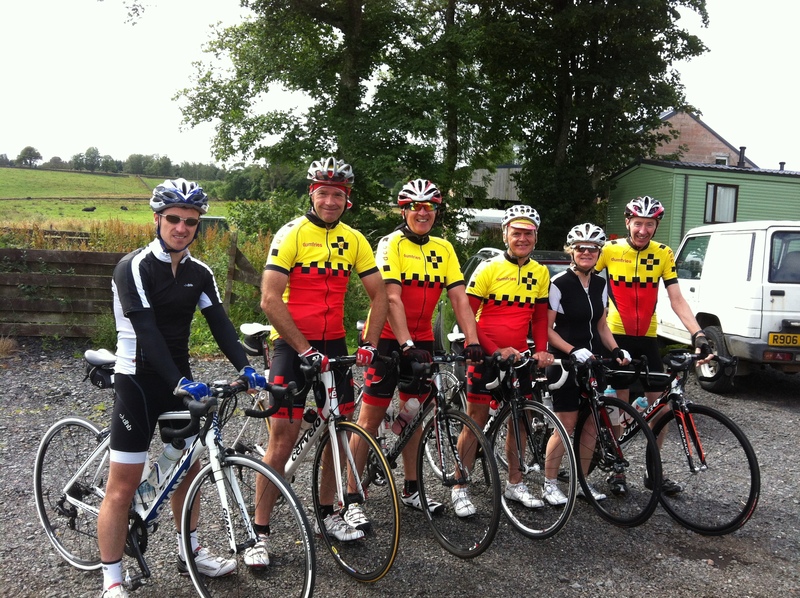 John suggested that when i was ready we could cycle back up to the Carsphairn road. I know that when I do this now, that the ditch will be empty as I ride by. The picture below is pretty recent. I love it. That’s me in the background on the left, kind of where I belong. I’m just a club cyclist again and I’m nearly fit. I ride fast when I can and slow when I want. I enjoy being on my bike more than ever. Long live the sun!